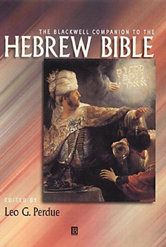 This comprehensive Companion to the Hebrew Bible offers a broad overview and survey of Old Testament study. It consists of newly commissioned articles from an impressive range of top international Old Testament scholars, from the UK, Europe, Israel, Canada and the US. Explores the history, archaeology, theology, sociology, and ancient Near Eastern context of the Hebrew Bible. Addresses questions of methodology, interpretation, and the academic study of the Old Testament. Offers an ideal tool for students, not just for use on one course, but over several years of study.